Floyd Mayweather Jr. and Manny Pacquiao during a press conference in Los Angeles March 11, 2015. 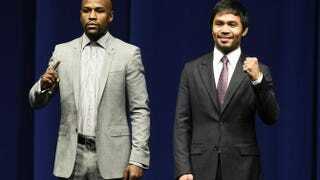 The two are set to box May 2, 2015, in Las Vegas. Of the loved and the hated. It’s a fight that ultimately exposes gaps in how we think, how we feel and how we live. It underscores cultural chasms that are evident in and outside the sports arena. Let’s start with income equality, as Mayweather prepares to make around $4 million per minute Saturday night if the fight goes the distance. Meanwhile, everyone else who can make a buck is wringing it for every last cent. Las Vegas hotel rooms are going for $400 to $900 a night or more. Promoters have charged admission for Friday’s weigh-in—an unprecedented move—and those $10 face-value tickets are fetching $200 to $500 on the secondary market. The MGM Grand released only 500 measly tickets for the general public to watch the match in person, which costs a cool $10,000 on average. For folks who aren’t balling on that level, the pay-per-view merely costs $100, a record price. However, this clash accentuates more than the sharp divide in our financial wherewithal. It also highlights the glaring difference between what’s acceptable from boxers (at least this boxer) and what’s tolerated from other pro athletes. Only Bill Cosby-truthers believe that Mayweather is not guilty of serial domestic abuse. The fact that his violence against women hasn’t reached a crescendo, like the uproar after Ray punched Janay in the elevator, is baffling to some and troubling to others. An exquisite defensive boxer, Mayweather’s slickest maneuvers have been avoiding repercussions … aside from serving 60 days of a 90-day sentence in 2012. His history is well documented, but most journalists until recently have ignored it, downplayed it or lobbed softball questions about it. When pressed on the issue, Mayweather has resorted to the rope-a-dope, blaming his accusers (“I’m black, I’m rich and I’m outspoken”) or misappropriating Scripture (“Only God can judge me”). That strategy would never work for Ray Rice or Minnesota Vikings halfback Adrian Peterson, excoriated in the court of public opinion for putting their hands on a woman and child, respectively. Critics suggest that Mayweather fans—or everyone who puts money in his pocket by watching or attending the fight—are de facto supporters of domestic abuse. That just brings another gulf to light, the different standards for athletes and other entertainers. Great art apparently trumps great athletics when the producers perform equally heinous acts. No one suggested boycotting movies featuring Sean Connery—who has admitted beating women—or Sean Penn—who once hit then-wife Madonna with a baseball bat. Ratings didn’t drop for Charlie Sheen, a habitual abuser who was TV’s highest-paid actor in 2010. People still purchased music by Chris Brown, who won his first Grammy three years after lumping Rihanna’s face. But the Dallas Cowboys were criticized in March for signing defensive end Greg Hardy, who had a high-profile domestic violence case dismissed in February. And last week, the NFL suspended Hardy without pay for 10 games due to the incident, which involved his ex-girlfriend. Are Cowboy fans supposed to feel bad about rooting for their team because of Hardy’s presence? Are boxing fans supposed to be ashamed for enjoying Mayweather, one of pugilism’s all-time greats? Some folks can separate the person from the performer—as we see in film, TV and music—and some folks can’t. It just seems as if society has way more trouble making the distinction when it comes to sports. Whether that’s because the biggest sports stars are often black and among the most famous citizens of that hue is open for debate. And the two sides are guaranteed to be separated by a lot of distance. Another recurring theme surrounding Mayweather-Pacquiao is the canyon between boxing’s past and present. Every 24 hours we’re reminded about the rarity of megafights nowadays, warned that this might be the last great fight. The sport was absent from network TV for nearly 30 years before returning in March. Conversely, Ultimate Fighting Championship in 2011 signed a seven-year, $100 million deal with Fox, bringing mixed martial arts into the mainstream. MMA fans view boxing like millennials view flip phones. Mayweather, 38, and Pacquiao, 36, won’t have much sway on the future, but fans of the sweet science have been reading the sport’s obituary forever. They believe it will stick around for several more decades. Dissenters argue that horse racing still exists, too, and it used to be right up there with boxing. The gaps in our processing won’t end once the fight is over. But they’ll close for however long the bout lasts. From round 1 until the final bell, the ring won’t have room for our conflicting feelings or mixed emotions. Only space for two men with different nationalities and contrasting personalities, meeting in one of the most-anticipated matchups ever. Finally, something everyone can agree on.